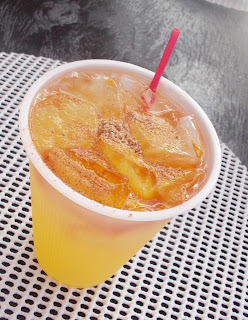 Who could resist trying something called the “World Famous Killer Bee” rum drink from Sunshine beach bar on Nevis? Not Galley Wench Tales! 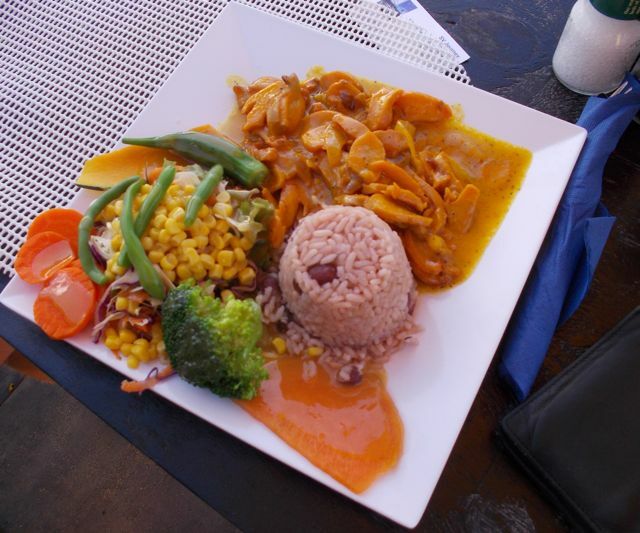 And a side of lambi (conch – think really big shellfish a bit like a chewy scallop) with that,to boot. It seemed the perfect end to a big chunk of our day spent on country entrance regulations. It was. so I guess it really is world famous. 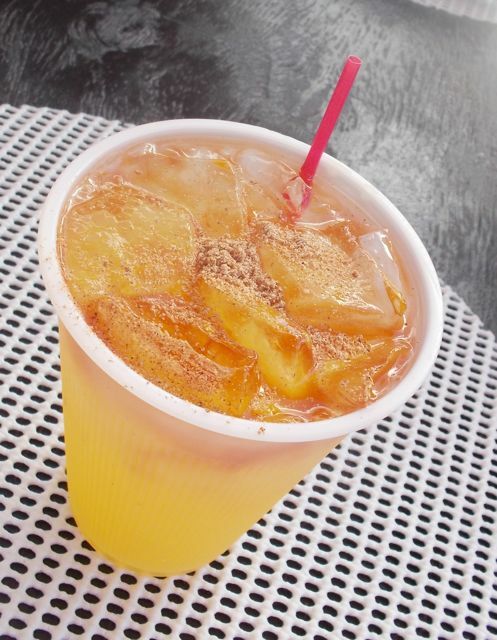 Pinky, our bartender and waitress, whipped out the premixed concoction from a bottle of Mount Gay Rum (though betting the Killer Bee was not Mount Gay), sloshed it over ice, and grated fresh nutmeg over the top. Presto. Much like a Long Island Iced Tea it was smooth, refreshing, and in this case Caribbean-fruity. But unlike a Long Island Iced Tea, I could definitely taste that this was no Shirley Temple drink. he was willing to have his picture taken. Despite the Caribbean, I guess I’m still not that used to rum drinks. Got a late start sluggy yesterday after waking up with a slight headache – major rarity for me. I’d been warned about those Killer Bees. 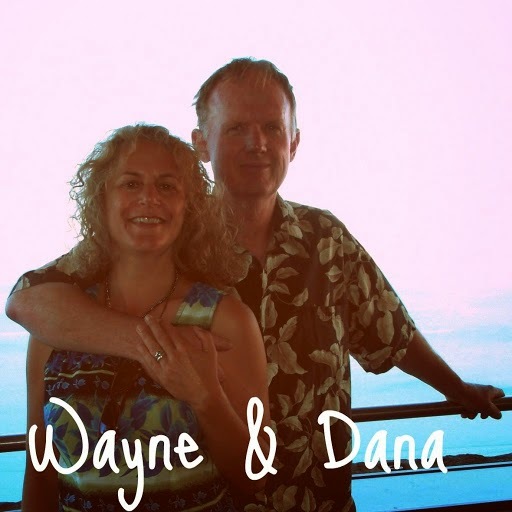 That why I only drank one – and nothing else but water! Does that mean more rum drinks? Or less? Hmmmm. You tell me! 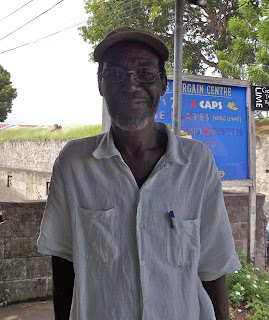 Our next taste of Nevis, literally, came when Wayne flagged down a fellow walking down the road in front of us, carring a clear plastic box of what looked like turnoevers. “Are you selling those?” Wayne asked. 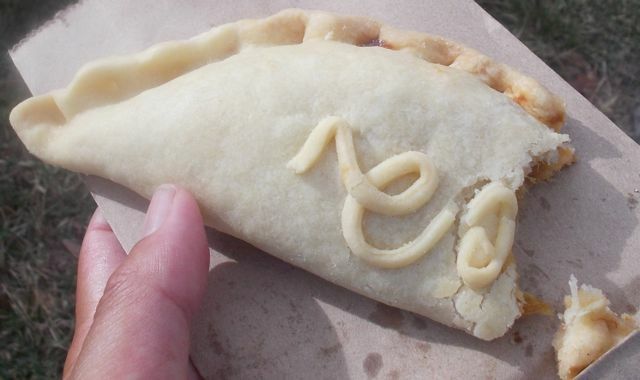 Savory salt fish pastry -- not at all "fishy." 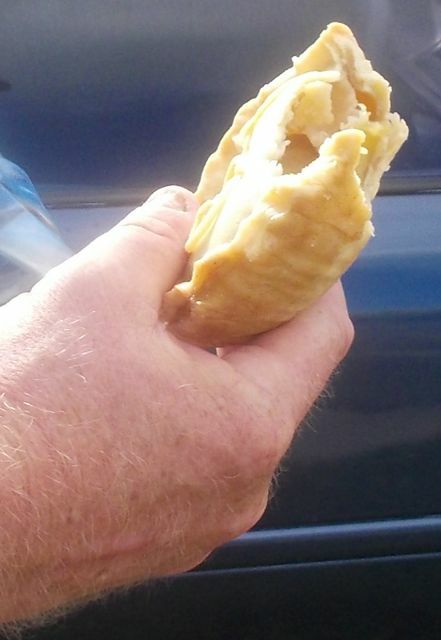 Wayne ate one of his apple turnovers, and I savored a salt fish one, which even the less culinary adventurous Wayne liked. 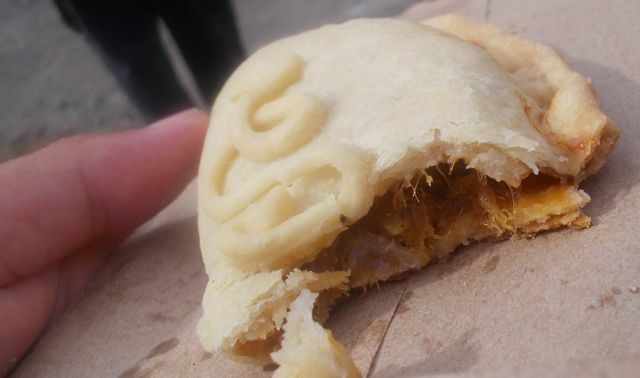 Perfectly light and flaky. Even my Dad, piemaker extrodinaire, would likely agree. They were pretty as a picture. Dang! to get a photo before we took a bite. The pastry... ah.... just a savory memory! Lambi... still looking for a recipe that I want to make for when I take the plunge and cook some up myself as we're seeing it sold more now where we go. If you're heading north, stop at Saba and see if Jason's Boogaloo bar is still in business. It's half way up the road to the "bottom", which is the top of the mountain. The top is now the bottom (shoreline).